While this sort of thing is of interest to students of music theory, Orchestral Tools' new sample library, Orchestral String Runs, is likely to be of far more practical use to media composers and orchestral mock‑up artists trying to earn a crust. 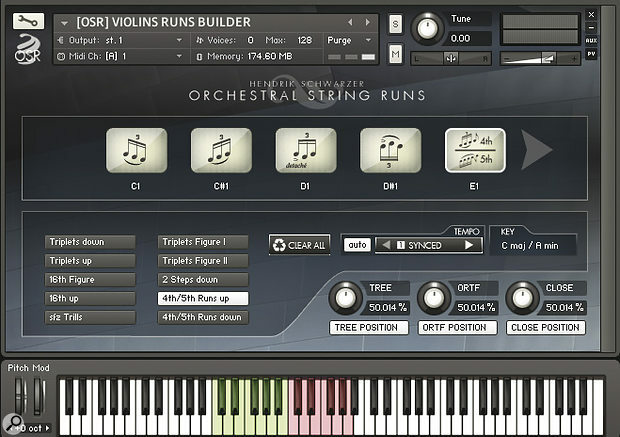 Building on the established orchestral library tradition of providing played octave runs in different scales and keys, OSR also contains a set of melodic modules allowing you to create your own string runs and figures in real time. The library is the brainchild of German composer Hendrik Schwarzer, a precocious young fellow who wrote his first full‑scale orchestra and choir piece at the age of 16. Feeling that the string runs in existing orchestral libraries lacked flexibility, Mr Schwarzer and his business partner had a word with the bank manager, booked 50 string players from the Belarus Philharmonic (with whom Schwarzer had previous positive dealings), flew to the former Soviet city of Minsk and spent three days recording a large collection of runs, figures, mini‑phrases, straight notes and legato intervals. Size‑wise, the Belarus string orchestra comprises a very respectable 14 first violins, 12 second violins, 10 violas, eight cellos and six basses, a much larger group than you'll find on most pop tracks, but falling a little short of the section numbers used in blockbuster movie scores. Around 25,500 samples were captured from three mic positions in Minsk's National Broadcast Centre scoring stage, creating a 6.68GB sample database; an imminent update (free to registered users) more than doubles that figure. Although unavailable at the time of writing, this major expansion should be available by the time you read this. OSR (sold only as a download) is formatted for Kontakt 4.2 and also runs on the free Kontakt Player 4.2, which can be downloaded from Native Instruments' web site. The sample data is presented as 10 compressed .RAR files of roughly 700MB in size; having downloaded them to your hard drive (which takes a while), you extract the contents of the first file and the other nine will automatically follow suit. Bear in mind that you obviously can't return the samples after you've bought them, so to avoid any misconceptions, check out the online demos at Orchestral Tools' site before buying. Orchestral String Runs basic runs patches feature combined violins and violas playing a variety of fast scale runs in all 12 keys. Set your key signature with one of the pink keyswitches, then choose your run(s) from one of 14 types (shown in blue). OSR's scale runs (which take the familiar shape of a quick dash up to a short target note) come in ascending, descending, up‑and‑down, single- and double‑octave flavours, and also feature a couple of non‑linear shapes that perform a zig‑zag movement en route to the top note. The high violins runs are enriched by doubling violas in the lower octave. For those who prefer a more transparent timbre, there are more conventional two‑octave unison violins runs, some of which add violas playing at the violins' pitch. The low strings follow the same pattern, with cellos and basses scored mostly in octaves. All in all, there are 14 types of major‑scale octave run, which you can see listed at www.orchestraltools.com/downloads/ARTICULATION_CHART.pdf. Eight of these 14 run types offer a minor‑key variant based on the scale of C, D, Eb, F, G, Ab, Bb and C. To switch from major to minor, simply whack up the mod wheel. 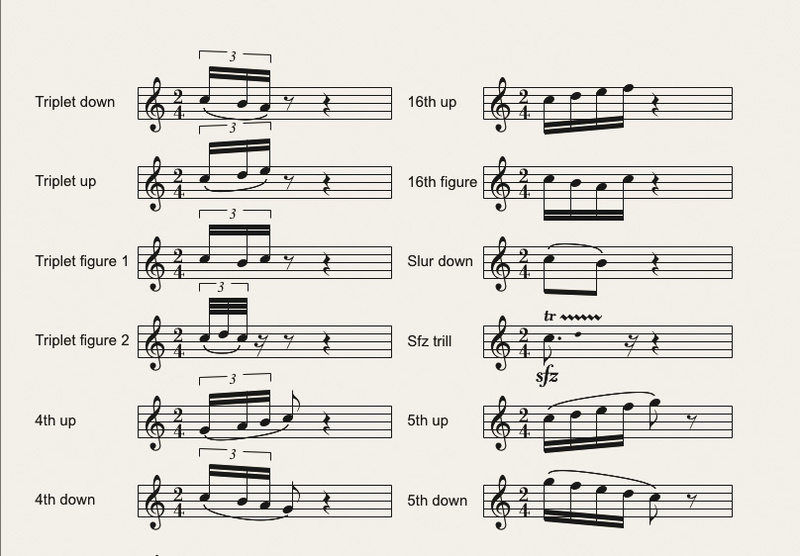 A useful 'fifth to fifth' option (based on the major scale with a flattened seventh) is also included. Conspicuous by their absence are chromatic, whole tone and ethnic scales, and any minor scale employing a natural seventh; however, you can construct your own custom scales using OSR's Runs Builder and legato Runs Transition patches (more of which shortly). If you're up for a bit of programming, the forthcoming free update supplies new run‑building figures that will enable users to construct chromatic, octatonic, Lydian and Dorian mode octave runs. Each run was sampled in all 12 keys, all of which are available within a single Kontakt instrument and may be selected via a keyswitch. The sample mapping is identical in each key, so once you've familiarised yourself with the keyboard layout, you can perform on‑the‑fly articulation and key changes with full chromatic freedom. As is the norm, the octave runs' default performance style is legato with all the run notes falling under one bow movement; some runs also have a spiccato version in which each note is separately bowed, creating a lively and more markedly rhythmic effect. If you'll pardon the pun, OSR has more strings to its bow than conventional played octave runs: its Runs Builder is an innovative key feature that provides a varied set of mini‑phrases performed by all violin players in unison in all 12 keys. These phrases are scale‑based, which means that in the key of C-major, the 'triplet up' figure of C‑D‑E becomes D‑E‑F when a D note is played, and B‑C‑D when you play a B. Similarly, when operating in the key of G the '16th figure' sounds as G‑F#‑E‑G when you play a G note, but changes to G‑F‑Eb‑F when you play the same note in the key of Eb major. Only scale notes are mapped, so if you select the key of B-major, all the white notes apart from B and E will be silent! Each patch has three built‑in mikings, which may be individually turned on or off and blended to taste. Drag the 'tempo slider' to manually switch between real-time, half-time and double-speed runs (the latter two variants are generated by Kontakt's time‑stretching). If you prefer, this function can be left set to 'auto'. While most of these groups of notes have a measured rhythmic delivery, some perform a more ornamental role: 'Triplet figure 2' sounds more like a fast turn (or upper mordant, as they're called in the trade), and a set of short, unmeasured 'sfz trills' don't follow any rhythmic scheme. These particular trills are scale‑based, so they automatically switch between a tone and semitone interval, depending on which step of the scale you're playing. An additional set of chromatically mapped violin short trills can be switched between tone and semitone using the mod wheel. Notated versions of the Runs Builder musical figures. The low strings' reduced menu of run‑building phrases is performed with generally good results, although I did find one ascending basses triplet sample that had the dubious distinction of containing no intelligible pitches. This brought to mind the old jazzers' joke, "What do you get when you write a unison note for two double-bass players? A semitone.” Before I get sued by the Belarus Philharmonic, I should add that this spot of bad intonation is the exception rather than the rule in this library. All the Runs Builder phrases are grouped into a single patch and selectable via user‑defined keyswitches; to assign a phrase to a keyswitch, you select an empty keyswitch slot and click on the name of the desired phrase, which loads that articulation into RAM. As ever, a second set of 12 keyswitches is used to determine the key signature. 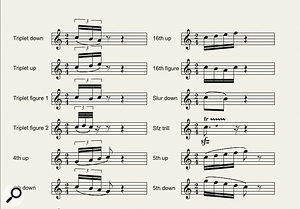 You can use these varied building blocks to quickly construct flowing, Baroque keyboard patterns (the '16th figure' works particularly well for that style), jigs and reels (for which the triplet figures are tailor‑made), expressive, sighing romantic intervals (the 'slur down' articulation) and dramatic warning interjections courtesy of the strongly attacking sfz trills. Supplementing the run‑building material is a set of violins‑only repeated figures designed for creating rhythmic ostinati. These are looped, so a single key-press triggers a series of seamlessly‑joined reiterations. Such stirring massed‑violin riffs are great for big orchestral flourishes, and playing them polyphonically can produce some brilliant symphonic effects — by jamming a few adjacent semitones together, I even managed a passable imitation of Bernard Herrmann's screeching Psycho strings. Precise loop points ensure that the figures stay locked together regardless of how long you sustain notes. OSR's innovative Runs Builder patches allow you to construct figure‑based violins performances in real time: load the articulation of your choice into one of the 10 play slots (five of which are shown on screen at any one time), select the appropriate key for your piece with one of the 12 green keyswitches, and trigger the phrases by playing the pink keys. Lots of fun when you get the hang of it! Although the keyswitch system is a little confusing at first, it didn't take long to master; the individual phrases flow together convincingly, their overall rhythmic cohesion stemming from the tight, controlled delivery and accurate timing of the phrases. I have one small criticism concerning the repeated violin figures: if you hold down a note and then press another key (even a silent keyswitch note), the held note's volume changes to reflect the velocity of the new key-press, which is not musically desirable. I imagine a small programming tweak by the makers could cure this. The scale‑based approach adopted for OSR's phrases and repeated figures has positive harmonic implications: if you play a three‑note chord, you'll hear a three‑part parallel harmonisation in the scale of the key you're using, rather than the somewhat unsettling effect of the same lick playing simultaneously in three different keys. On the other hand, this does make the programming of chromatic passages tricky; you have to perform quick key changes to access any accidentals missing from the current key, but at least it keeps your musical brain ticking over! All the run‑building phrases, octave runs, repeated figures and even the chromatically‑mapped trills are tempo‑sync'ed. Kontakt 4's Time Machine 2 is used to adapt their playback speed to the host's tempo. Although very efficient, this time‑stretching algorithm can't cope with extreme tempos, so to avoid runs sounding unfeasibly fast or overly stretched, OSR's producers designed an 'auto‑tempo mode', which tracks the host tempo and automatically plays runs at normal, half or double speed to keep them sounding musical. If you wish, you can disable the auto‑tempo and switch between the three play‑speed options using a small 'tempo slider'. However many types of scale and melodic figure are provided in a library, there will always be times when you need to play your own. With this in mind, Orchestral Tools built the Runs Transition patch, a playable set of legato short notes performed by violins and violas. The patch (which uses interval‑sampling and scripting) is optimised for the creation of fast runs. I found that it coped very well with chromatic runs, but other types of scale initially sounded less fluid. However, when I used my sequencer's note editor to even out the velocities and make sure all the notes overlapped slightly, the results sounded agreeably smooth. This versatile patch has a built‑in repetition mode for fast ostinatos, and though the legato intervals themselves are monophonic, you can use it for chordal work if you play in a non‑legato style. OSR's straight notes come in sustained and staccato flavours; blue keys indicate the Whole Ensemble's six‑octave range. In addition to the various performance styles described above, the Belarus musicians play straight, two‑dynamic sustains and staccatos. These sound very good indeed: the violins' and violas' quiet notes have a beautiful, languorous, breathy timbre but also acquire plenty of bite and attack when played loud, while the low strings can sound both tough and lyrical. Both sections' staccatos have the brisk, forceful attack and machismo attitude required for in‑your‑face action movie scores. Highly effective and very playable, although I occasionally found myself wishing that the sustains had an intermediate mf dynamic. The high and low strings are presented as separate instruments that overlap in pitch by about an octave and a half. In theory, this overlap could pose a minor issue if you wanted to layer them into a full strings patch, but the makers have already dealt with that problem by providing a 'whole ensemble' instrument with a blended middle range. 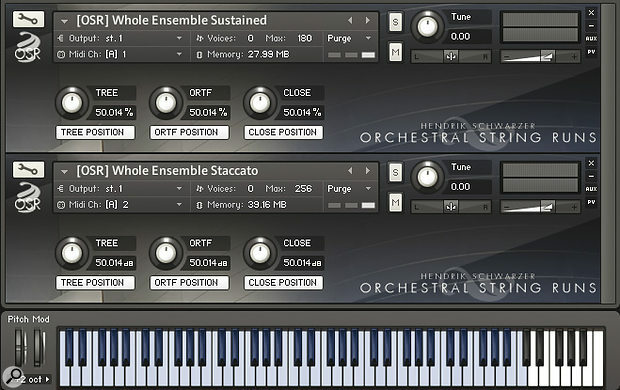 This means you can use a single Kontakt instrument to access the full, six‑octave orchestral strings range — very handy. Rather than providing a separate instrument for each performance style, OSR bundles groups of keyswitchable articulations together under one roof. While that's convenient for performance, the sheer number of samples involved has an adverse effect on loading times. When you load a big instrument such as the 500MB Violin Figures, you'll see Kontakt's memory‑counter meter continue to climb long after the sample-loading progress window has disappeared from view. By contrast, the straight notes load almost instantly. All instruments load with three microphone positions permanently in place: the 'close' miking clearly reflects the stage placement of the players, with high violins left of centre and low strings positioned on the right. The same stereo image is subtly discernible in the more distant ORTF (Office de Radiodiffusion Télévision Française) miking, which utilises a pair of angled cardioid mics. The classic three‑microphone Decca Tree spaced array produces a big, spacious room sound with a slightly narrower stereo image. Although you can turn any of them off, Orchestral Tools recommend using all three mic positions simultaneously. I'd second that, as the three blend beautifully, with no hint of phase‑cancellation, and each sounds fat and full in its own right. I enjoyed the opulent acoustics of the vintage Minsk facility, which the producer likens to the early Star Wars recordings. There's plenty of room sound in evidence, but its ambience is not of the cathedral reverb ilk; if you want that 'swimmy' effect, you'll have to add it externally, as this library has no convolution reverb. Although it doesn't match the musical complexity of Slonimsky's Thesaurus, OSR gives users plenty of options to build fast string runs and lines. Its disparate elements work together in a natural‑sounding way, testimony to the fact that the producers studied figures commonly used in string‑writing and based their scoring on well‑established historic principles. The makers claim that their library gets its character from focusing on the sound between the notes rather than the notes themselves; they admit that the intonation isn't always perfect, but justify that by saying that OSR is designed to be organic and to reflect the humanity of the players, rather than being clinically perfect. Whatever your take on that, I'd say that the few instances of dodgy pitching I heard would not (with one exception, noted earlier) set off any alarm bells, given that they occur fleetingly within a fast run. Flaccid delivery or sloppy timing would be a far worse flaw in this context, and that doesn't happen here. It helps that the library's producer is a busy composer whose work involves creating orchestral arrangements for public consumption on a regular basis. Although I don't normally single out online demos, I can recommend Hendrik Schwarzer's short piece 'Catching One Dream' to give you an idea of what OSR is capable of. For my part, I'm confident that the lively runs and figures in this collection will add panache to my orchestral demos, and provide a bit of compositional inspiration into the bargain. 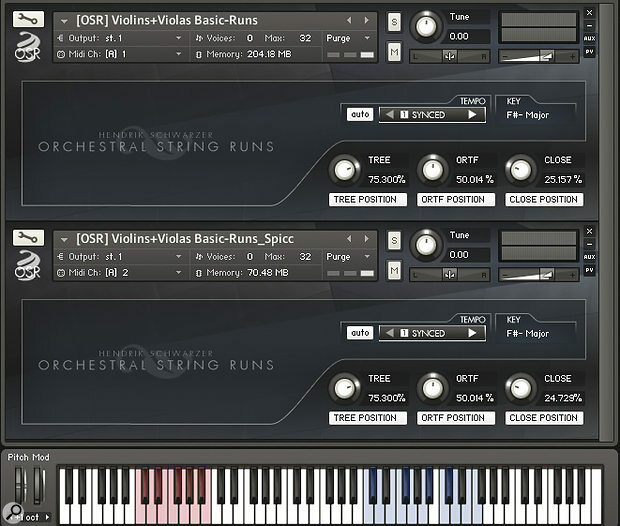 Most orchestral string libraries contain fast octave runs, usually played in ascending and descending forms with major, minor, chromatic and whole-tone scale options. OSR is almost unique in making a sole feature of this performance style; to our knowledge, the only library in a similar vein was Peter Siedlaczek's 1.9GB Smart Violins, originally issued in Akai, Emu and Gigasampler format in 2001. Now re‑formatted for Kontakt, Siedlaczek's title is only available as part of his Complete Classical Collection bundle. Orchestral Tools don't publish system specifications for OSR, but its relatively light RAM footprint means that it will run perfectly well on modest systems — just make sure you have 14GB of free disk space for the samples (7GB for the compressed download files and the remainder for the uncompressed data). The library works only with Kontakt 4 or Kontakt 4 Player, the minimum requirements for which are listed at www.native‑instruments.com. 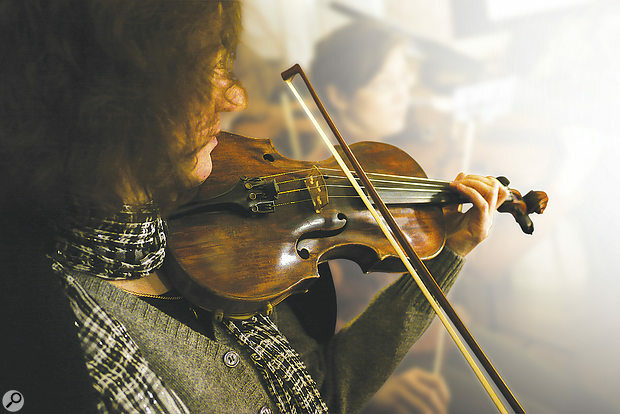 Large string sections recorded in a classic‑sounding, historic scoring stage. Recorded from three mic positions. Provides a good selection of lively run‑building material and useful tools for programming it. Also contains very good straight notes. Currently lacks certain types of scale run. OSR features a large, professional European string orchestra performing a wide variety of hard‑to‑program runs and figures with commendable spirit and accuracy of timing. It benefits from musically intelligent programming and also has some great sustains and staccatos. In short, it's a very effective collection that will add vitality, movement and realism to your orchestral scores. $399 including 19 percent Euro VAT. $399 including 19% Euro VAT.